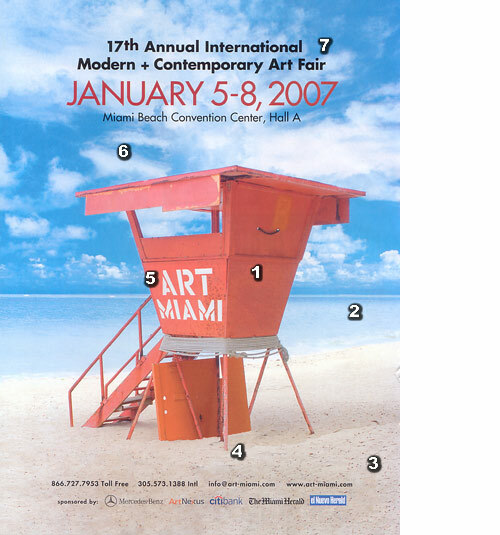 You are viewing articles tagged artmiami. More on AM: Category 305 (“But honestly, does Art Miami have to be this boring?”) Miami Art Exchange writeup (“only a few galleries . . . featured work that is clearly 2nd and 3rd rate at best”) and photoset. Update: And New Times, which gives props to Carol Jazzar and Gismo. “There certainly is a lot of blegh art at Art Miami . . .” TnfH goes for a look, and suggests a change of date. Agreed. What's up with the Art Miami ad? Not a real Miami lifeguard stand. I have no idea where this is from, but not anywhere in driving distance. Not the real Miami ocean. Give me a break; we’ve seen the ocean here, and it’s never been this color. Ever. This is probably in the Caribbean, and then color-tweaked with an eye toward absurdity. Not a real Miami beach. It isn’t this color. It doesn’t look like that. Even with all that, those three elements are all assembled in photoshop — note the wishy-washy hand-painted shadow. Look where the legs and ladder meet the sand. They didn’t even try. In fact, I’m not even sure the sand and water are from the same photo. Text not really stenciled. More photoshop, and again not well done. Absurd cloud-collages are de-rigeur these days (see here), but this one is particularly laughable. I detect pieces from maybe 5 different photos. Actually, the typography’s not bad. I kind of like this part.